An employee who is hurt on the job is usually compensated through workers’ comp, if the employer has workers’ comp insurance. However, if there are other parties that contributed to the accident by their negligence, the worker could stand to receive financial compensation from them as well. David’s client received payment for his injuries from his employer through workers’ comp, but because other companies contributed to his accident through their carelessness or recklessness, David was able to win a $6.1 million settlement that covered past and anticipated medical expenses, along with other related costs. 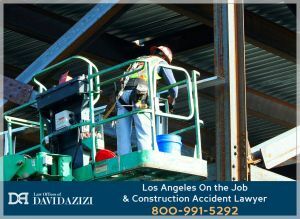 As a very experienced Los Angeles-area job site and construction accident attorney, David knows that settlement and verdict amounts vary widely based on the unique circumstances of each case. So if you’ve been injured on the job, we urge you to call our offices now at 800-991-5292 to discuss your particular accident with David. Any time of day and any day of the week, 24/7, we will connect you quickly with David, who has been practicing law with a remarkable 98-percent success rate for 21 years. This initial consultation is absolutely free, and if David takes your case, you won’t owe him a penny until he wins you the financial compensation you deserve. In the very unlikely event he does not succeed, you won’t need to pay him anything at all. 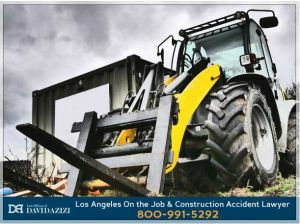 Sadly, many of these job and construction site accidents result in very serious injuries. Tragically, some are fatal. Other accident-related costs may also apply. David’s experience and effectiveness is affirmed by his peers. Major legal services corporation Avvo rates David as “Superb,” its highest rating. Additionally, Expertise.com names him as one of its Top 20 Personal Injury Lawyers in Los Angeles. Most recently, the very prestigious legal organization Super Lawyers rated David among Southern California’s top attorneys for the sixth time. David’s many happy clients also testify to his success in representing them; you can see some of their testimonials on this website. One thing that David’s clients particularly appreciate is his accessibility. Unlike most attorneys of his legal stature, David gives each client his cell phone number, so they can ask him any questions they have as they come up. They also appreciate his genuine sympathy for what they and their families are going through; such compassion comes partly from his own experience as a married father of three young children. If you have suffered an injury on the job or at a construction site, we urge you to retain an accident attorney right away. Of course, we recommend David, who has proven himself over 21 years to be one of the Los Angeles area’s most effective and successful attorneys. Call now at 800-991-5292 to begin your free consultation.